The first meeting of the Society for session ’80–’81 was held Oct. 9th, Mr. Wilson in the chair old members signed up & new ones elected—)—Election of Officers being the first in order of business, upon nomination by Mr. Lefevre of Mr TW Wilson for President, the latter gentleman was unanimously elected to that office. Mr. Pringle T. Youmans was then nominated & elected vice president & Mr. C.W. Kent Treasurer. Mr. Wilson gave notice that he would at some future time introduce a resolution to appoint a committee for revising our constitution. 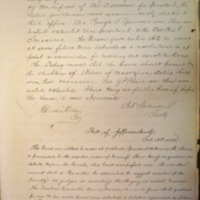 Mr. Dabney moved that the house should proceed to the election of Editors of Magainze, stating there were two vacancies—Mr. J.P. Blair was then nominated & elected. There being no further business before the house, it was adjourned. University of Virginia. Jefferson Society, “Jefferson Literary and Debating Society Minute Book,” 1880 October 9, WWP17257, Jefferson Literary and Debating Society Records, Woodrow Wilson Presidential Library & Museum, Staunton, Virginia.